March. A month of transition. Winter starts to turn to Spring, baseball training begins, and gamers start to emerge again from their basements. For me and about 55 other gamers in 2007, this meant descending on the second annual Tennessee Game Days event. It also meant that the event had grown from the single-day event from the previous year to a three-day event of non-stop, full-on gaming. Can you take it? The event started early, at 10:00. Some of us locals arrived early to assist with the set-up. Rick had arrived earliest, to secure the conference room at the hotel, and the rest of us came in to help with the assorted odd jobs of stocking the fridge with drinks, hanging the signs, and getting the tables in order. This took about 45 minutes, but with everyone helping out, making plans to play certain games as they went into the library, it seemed to go by much more quickly. Folks began to arrive around 10:00, but it was a sparse crowd to begin with. We started out with maybe 15 attendees, most of them from Nashville, but we also met up with some folks from Chattanooga, Kentucky, and Mississippi. 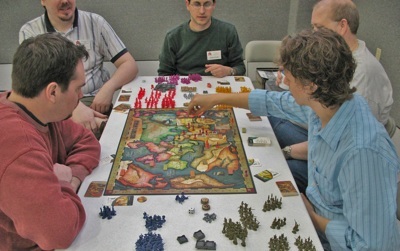 Some of us started out with the longer games we had been wanting to play for a while (Canal Mania), others chose to jump into some lighter, shorter games (Iliade), and still others just tried to play the games they liked to play with people they hadn't seen in a while (Web of Power). It was a diverse group, but a successful one. Throughout the day, more people arrived, and we hit the 25 mark by dinner time. Unfortunately, due to scheduling restraints at the hotel, we had to break off and move to another location. Most people took advantage of the break to eat dinner, but we locals stuck around to help move all the stuff from the hotel to the church. Those of us with SUVs were particularly requested. We ran into a small, unexpected snag during the move from the hotel to the church: The sign for the church was down, thanks to a driver taking it out when he missed the curve. A few people got lost going from one place to another, but most everyone made it, though a little bit later than they anticipated. The space, though, was well received. The church had a large, half-gymnasium space, along with a number of rollaway tables to accommodate even the largest of games. Drinks were provided at a small cost, the game library was tremendous, and a variety of games were available for playing. Some dexterity games hit the table at about this point, including Polarity, Pitchcar, and Hamsterrolle, and Rick started to offer out the door prizes, as well. There were copies of Cluzzle, Vegas Showdown, and a seemingly unlimited supply of Loco!, along with embroidered t-shirts and caps with the Tennessee Game Days logo on them, and anyone who had registered for the event was eligible for prizes. The big event for Friday night was the mega-Werewolf game, with an estimated 18 people involved in the game. 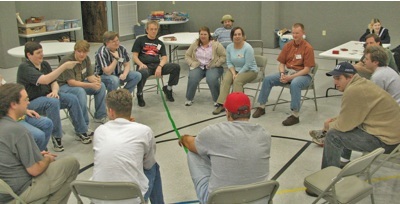 Another, smaller game broke off from the larger group, when players raised concerns over the feasibility of such a large number of people, so a raucous game of Werewolf and a quieter game with about 9 people took place at the same time. Following the Werewolf games, we packed up and went back to our hotels and/or homes for a night's few hours of sleep. This was the big day, the full-day event attended by most everyone from the start until the end of the whole thing. We reached our peak of attendance this day, with about 45 people participating in a number of different games. The longer games hit the table at this point. There were sightings of Age of Steam, History of the World, and 1870, among many, many others. The biggest hit was probably the Crokinole board, courtesy of Chris, from Mississippi. The prize drawings continued on Saturday, with many (many) copies of Loco! being passed around. There was also a scheduled Icehouse games presentation of Undercut, which was well received by those new to the game. 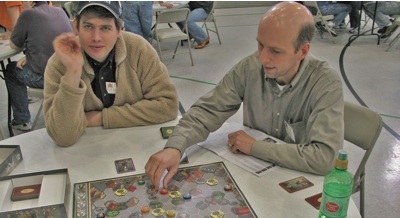 The open gaming format led to many people playing new games, other players getting a chance to play games that they had never had the chance to try before for one reason or another, and even allowed for old friends to catch up with each other. Many, many games were played on Saturday. Before the end of the evening, we also held our second annual Take it Easy tournament. About 16 people participated in this hexagonal, bingo variant and the top three finishers took home some (more) prizes. Sometime after midnight, the day came to a close and gamers pitched in to break down the site. For most, Sunday was a short day, since people had to travel to get home. Most left around lunchtime, but many of the more local gamers stuck around until the end of the day, at 6:00. 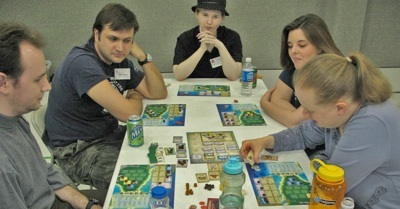 Age of Steam was sighted again, as were a number of Crokinole games, some older games like Wildlife Adventure by Wolfgange Kramer, some longer fare like Roads & Boats and a then-new game that piqued the interests of many: Mr. Jack. It was still well-attended, given the short day, but it helped that it was held in the hotel where many of the out-of-town attendees were staying. We topped out with about 25 people that morning and afternoon -- with some people showing up just for this Sunday session. All in all, Tennessee Game Days was a tremendous success. There were some small glitches, due in part to the growing pains of the event, but most of those were behind the scenes, and didn't interfere with the attendees' fun. The 2008 event should prove to be an even more popular event, with longer hours and a single location, and even more people coming in from out of state to attend. We hope to see you there! « Return to the list of events. Copyright © 2007-2009 Tennessee Game Days. Tennessee Game Days is an event produced and administered by the Tennessee Game Players Association, Inc.